Missha recently had their huge sale and I madly purchased square-shaped eyeshadows (not including the duos). So, I decided to do quick swatches and to review my Missha eyeshadow collection in case you are interested. As you can tell, GPP01 is EXTREMELY shimmery and DOES accentuate wrinkles once it is applied on eyelids. To make the story even worse, pink eyeshadow makes your eyes look reeeeeeeally puffy (and thus, you have to incorporate this eyeshadow with another eyeshadow of darker shade). However, if you are someone who can manage of all those problems and still love this eyeshadow colour, great. give it a try. To complain more about it, it is very shear and doesn't last that long. Within 30min~1hr, you basically don't have anything left but shimmer all around your eyes. THIS WAS AN ABSOLUTE NO-NO: quality that matches the price though. This eyeshadow was my least favourite. With extreme amount of shimmer, this eyeshadow seems to have no colour or shade whatsoever once it is spread out. You have the choice of packing it on your eyelids but it doesn't last more than 2 hours. This was my absolute NO-NO but, again, such quality was what I was expecting from such price. This was my MOST FAVOURITE eyeshadow from Missha. The colour lies in between grey and khaki so I think everyone can work it, if they are okay with metallic eyeshadows, of course. I didn't like metallic eyeshadows until I gave it a try from Missha..
To explain more pros about this eyeshadow, it lasted all day for me (10+ hours on my oily eyelids on one of the humid days in Seoul) and it was amazing for a $2.50-eyeshadow (price before sale: around 4000WON, $4). It was very smooth and highly-pigmented as well. My friends complimented about this eyeshadow and almost everyone (who is interested in make-up) asked me about this product. I really have nothing to complain about this eyeshadow. I'm wearing it almost everyday now and still love it. I purchased a back-up and still think of buying another back-up. Quality: ★★★★★ (5/5), just because that's the maximum rating i can give. This was my only "Shine Pearl" eyeshadow but I really cannot tell the difference from their metallic eyeshadow line from shine pearl eyeshadow line, other than the fact that this one contains less shimmer. It doesn't last long and hardly visible once it is spread out. I really don't know why I purchased this one (probably wanted to play mix and match with the colour) but I wouldn't use this eyeshadow for sure. I have to confess that, yes, I purchased this one just because it was $2ish. My first impression was that it reminds me of Sleeping Beauty and I still think that (it's just my personal taste of cosmetics so please don't mind that!). However, this eyeshadow has mid- to high-pigmentation, soft, and shimmery. I don't know if it lasts all day (I'm really afraid of trying it out) but what I know for sure is that this eyeshadow much better than GPP01. I was a bit disappointed with this eyeshadow only because it was too shimmery instead of metallic. However, other than that, I was still satisfied with the eyeshadow and loved it. Definitely long-lasting but I just didn't give it a try only because such shade (for me) works better in Fall/Winter. It is a really warm-toned brown and I didn't feel like I really need more shades that remind others of heat, warmth, and humidity. I really think people had enough :'( but I really love the shade. It would be one of the eyeshadows that I would recommend to others. This eyeshadow is the one that you can see from the very right corner of the swatches from the bottom row. Once you become a fan of KH01 and BR02, you would love this eyeshadow as well. I would, once again, say that the problem with these Missha metallic eyeshadows is that they are just TOO shimmery. However, if you don't mind that, you would probably favour this one. Quality: ★★★☆ (3.5/5) it was too shimmery though. This duo eyeshadow reminded me of "Glamoflage 03" from Sephora's eyeshadow collection although this one costed 2940WON ($2.50), which is more than six times less than Sephora's (and I thought Sephora's eyeshadows are cheap :P). And the colours are goooooooorgeous. One is a metallic gold/bronzer shimmer and the other is moss green shimmer. While I'm obsessed with both shades, both satisfy me with high-pigmentation. The glitters fall everywhere, but other than that, it works amazingly. For the glitters, what I do is that I wet my brushes before applying these eyeshadows and water holds the shimmer particles pretty well. I'm 100% sure I'll purchase a back-up for this one (or purchase two back-ups). 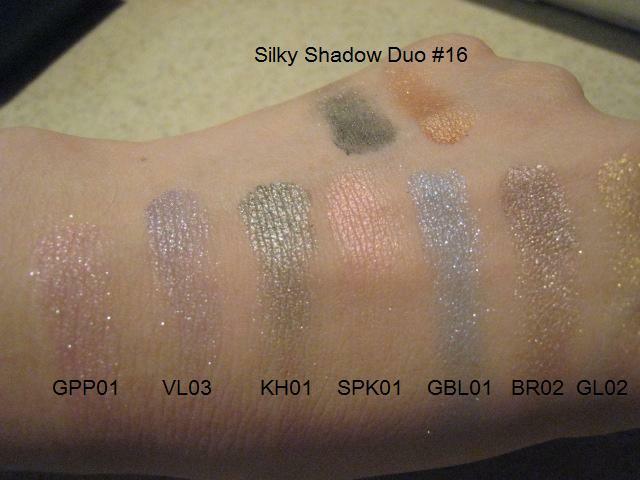 I really cannot make my mind when it comes to this eyeshadow and KH01. I absolutely cannot LIVE with these too. Quality: ★★★★★ (5/5) and i wish i can give hundred more.